Folks from Eliot, Boise, Humboldt, and King neighborhoods gathered at the Friends of Trees Office on MLK Jr Blvd to register and enjoy breakfast and coffee provided by Noah’s Bagels, Ristretto Roasters, Goldrush Coffee, Grand Central Bakery, and my own homemade oatmeal. After a few words from the FoT Team and Neighborhood Coordinators, everyone divided into crews of 7-10 people and went to their first destination to plant trees. Since the FoT Office is located in Eliot, most of the Eliot residents were able to simply walk from house to house while my husband and I drove a pickup truck of trees and supplies. Our first planting was in a vacant grassy lot behind the Cascadia Behavioral Healthcare facility. The businesses adjacent are teaming up to create a community garden and their first step was planting a Plum Beauty Semi-Dwarf tree. Our crew leader gave a demonstration on safety and how to best plant the trees and before long the first tree was in the ground and staked. Throughout the morning our team planted 13 trees; most in parking strips but a couple in yards as well. We planted Plum, Pear, Japanese Snowbell, Rocky Mountain Glow Maple, Japanese Stewartia, Hawthorne, and Royal Raindrops Crabapple. I had the pleasure of meeting several new neighbors as we worked side by side. By the time we got to the last couple of trees we were all experts; everyone finding their particular role whether it was getting water, unloading equipment, digging, making sure the tree is straight, staking them, or tagging them with care instructions. Afterwards, our famished team returned to the FoT Office where we enjoyed lunch provided by Pizza a GoGo, Mississippi Pizza, Cha-Cha-Cha, and Eddie’s Pizza. Many neighbors also brought assorted crock-pots filled with hearty meals. Widmer Brothers Brewing supplied a keg and, over a beer and grub, we shared stories of our day with other groups of planters. 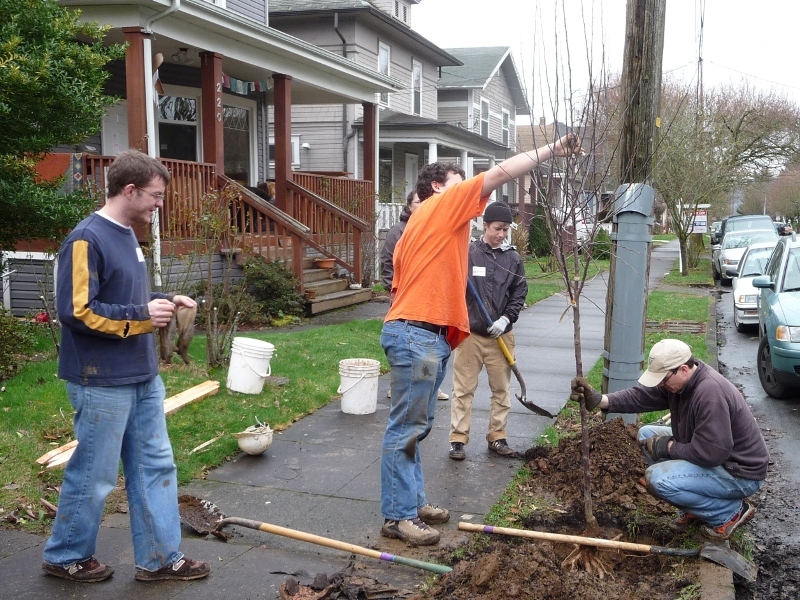 In total, 18 trees were planting in Eliot Neighborhood that day. My husband and I didn’t plant trees at our home this year because we planted parking strip trees with FoT 5 years ago. Since then we’ve been involved in the annual event almost every year and my husband has been our Eliot Neighborhood Coordinator for the last 3. I am amazed at how much our own trees have grown over the last few years compared to the new ones we helped plant this season. 5 years from now the same will be true for the ones planted this year. FoT plantings really are a community building event. Not only do residents receive great trees for a reduced price and get assistance planting them the correct way they also meet and help other neighbors with their trees. The most common comment we hear is they weren’t really looking forward to the community building aspect of the event, but they all say at the end of the day how great it was to meet so many people in their own neighborhood. It will be nice for them to exchange pleasantries with their fellow planters when they see them drinking coffee at Goldrush or out walking the dog. If you’re interested in getting involved with Friends of Trees, visit friendsoftrees.org. They have events going on almost every weekend. 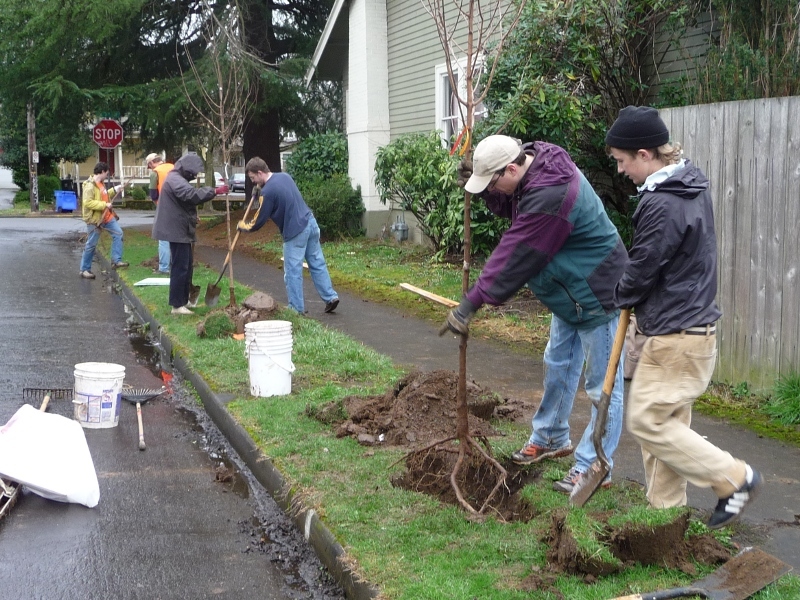 The annual Eliot tree planting day is usually the 2nd Saturday in February. Contact trees@eliotneighborhood.org if you’d like to help next year.